Uralic Neopaganism is a category encompassing contemporary movements which have been reviving or revitalising the ethnic religions of the Uralic peoples. The rebirth has taken place since the 1980s and 1990s, after the collapse of the Soviet Union and alongside the ethnonational and cultural reawakening of the Uralic peoples of Russia, the Estonians and the Finns. In fact, Neopagan movements in Finland and Estonia have much older roots, dating from the early 20th century. The Estonian native religion (Estonian: Maausk, literally "Native Religion"), or Estonian Neopaganism, is the name, in English, for a grouping of contemporary revivals (often called "Neopagan", although adherents of Estonian native religion generally don't use the term) of the indigenous Pagan religion of the Estonian people. It encompasses "Taaraism" (Estonia claim that "out of all the religions they have the warmest feelings towards Taaraism and Maausk". The Tursaansydän, a Finnish Pagan symbol. The Finnish native religion (Finnish: Suomenusko: "Finnish Faith"), or Finnish Neopaganism, is the contemporary Neopagan revival of Finnish paganism, the pre-Christian polytheistic ethnic religion of the Finns. A precursor movement was the Ukkousko ("Ukko Faith", revolving around the god Ukko) of the early 20th century. The main problem in the revival of Finnish paganism is the nature of pre-Christian Finnish culture, which relied on oral tradition and very little is left. The primary sources concerning Finnish native culture are written by latter-era Christians. They may be biased, tainted or unreliable. The national epic is the Kalevala. There are two main organisations of the religion, the "Association of Finnish Native Religion" (Suomalaisen kansanuskon yhdistys ry) based in Helsinki and officially registered since 2002, and the "Taivaannaula" association headquartered in Turku with branches in many cities, founded and officially registered in 2007. The Association of Finnish Native Religion also caters to Karelians and is a member of the Uralic Communion. Arola, Iiro: "Ni sit mä tajusin, et on muitakin kuin minä” – Suomenuskoisten sosiaalinen identiteetti. pro gradu -opinnäytetyö. Helsingin yliopisto/ Teologinen tiedekunta, 2010. Teoksen verkkoversio. Arola, Iiro: Suomenuskoiset erottautuvat muista uuspakanoista. Teologia.fi. 21.1.2011. Filatov, Sergei; Shchipkov, Aleksandr. Religious Developments among the Volga Nations as a Model for the Russian Federation. Religion, State & Society, Vol. 23, No. 3, 1995. Filatov, Sergei; Shchipkov Alexander. Udmurtia: Orthodoxy, Paganism, Authority. Religion, State & Society, Vol. 25, No. 2, 1997. Napolskikh, Vladimir: Заметки на полях книги «Неоязычество на просторах Евразии» // Acta Eurasica. 2002. № 1. Rein Taagepera. The Finno-Ugric Republics and the Russian State. C. Hurst & Co, UK, 1999. ^ Maavalla Koda. The Estonian Native Religion. ^ a b Jüri Toomepuu. Maausk, the belief system of indigenous Estonians. Presentation at KLENK 2011, published on January 7, 2012. St. Petersburg, Florida. ^ Ahto Kaasik. Old Estonian Religion. Maavalla Koda. ^ a b Uskonnot Suomessa. Suomalaisen kansanuskon yhdistys ry. ^ Uskonnot Suomessa. Taivaannaula ry. ^ Joshua Project. Mordvin-Erzya of Russia. ^ Republic of Mordovia. В селе Чукалы прошел эрзянский праздник "Раськень Озкс". ^ Uralistica News. Мордовские СМИ молчат о празднике «Эрзянь Раськень Озкс». ^ 2013-це иень «Раськень озкс». vaigel.ru. ^ Joshua Project: Udmurt, Votyak. the Association of Finnish Native Religion. According to 2012 statistics, 2% of the population of Udmurtia adheres to forms of Paganism. Victor Schnirelmann reported an adherence of 4% for the Udmurts alone. The Joshua Project reports a figure of 42%. The Udmurtian Pagan revival circles sprang out of the Demen (Udmurt for "Society") movement which was established in December 1989 for the protection and restoration of the Udmurt ethnic culture. Udmurt Vos as an institution was founded in 1994. Udmurt Vos (Udmurt: Удмурт Вось, literally "Udmurt Faith") is the ethnic religious revival of the Udmurts, a Volga Finnic ethnic group mostly inhabiting their republic within Russia, that is Udmurtia. Amongst the Udmurts, as in other Finno-Ugric republics in the Volga region, the revival of Paganism is inextricably intertwined with the revival of national-ethnic culture and awareness. The Mordvins were almost fully Christianised since the times of Kievan Rus', although Pagan customs were preserved in the folklore and few villages preserved utterly the native faith at least until further missionary activities of the Russian Orthodox Church in the 17th century and in the early 20th century. The Neopagan revival was started in 1990, alongside that of many other native religions in Russia, just in the verge of dissolution of the Soviet Union. The Mordvin native religion, also called Erzyan native religion, or Mordvin-Erzyan Neopaganism, is the modern revival of the ethnic religion of the Mordvins (Erzya and Moksha), peoples of Volga Finnic ethnic stock dwelling in their republic of Mordovia within Russia, or in bordering lands of Russia. The name of the originating god according to the Mordvin tradition is Ineshkipaz. 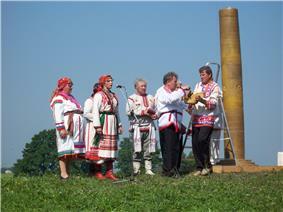 Ritual preparations for the Rasken Ozks, the Mordvin national worship ceremony.